Once an admin has added learners to your account, you can find learners to add to your live training. If adding learners via CSV file, the CSV should contain only learners you want to add to the specified live training. 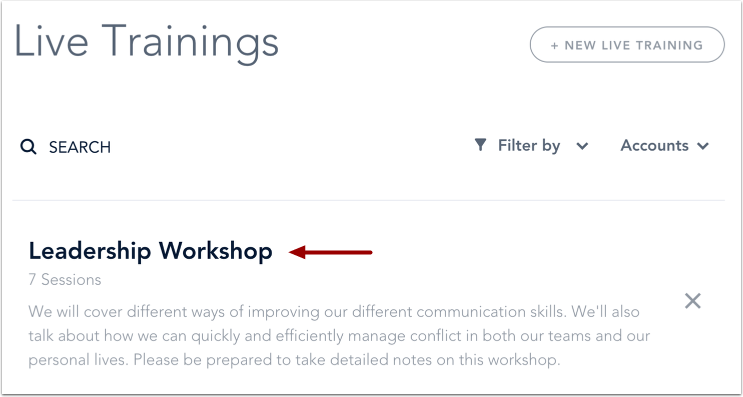 Adding learners to your live training immediately sends a training invitation email to all learners. Click the Add Learner button . To add multiple learners via CSV file, click the Add via CSV link . Note: Adding learners to your live training immediately sends a training invitation email to all learners. In the text field, enter the name of a learner in your account. Click the name when it appears. View the learner in your training. Learners can be removed as long as the learner has not completed the training. To remove a learner, locate the learner and click the Remove icon. Learn how to remove multiple learners via CSV file. You can also remove learners from individual sessions. Note: If a learner cannot be removed, the learner was added to your live training through a group. 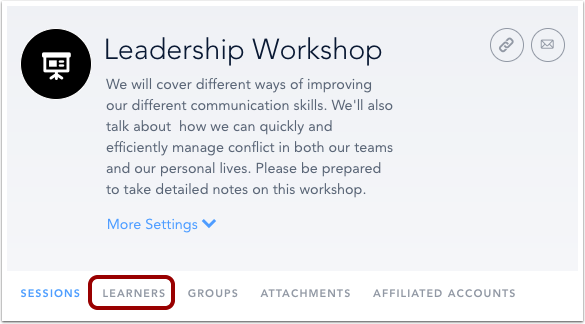 The only way to remove the learner is to edit the learner's group or remove the entire group from the live training. See the Groups tab to identify the user's group. Previous Topic:How do I enable Open Enrollment for my live training? Next Topic:How do I find a group to add to a live training? Table of Contents > Manage Live Trainings > How do I find a learner to add to a live training?